Tianjin HeShunChang co.,ltd is a Comprehensive company which new type scaffolding ,manufacturing ,design ,logistics services and so on. he company is located in Tianjin Jinghai Industrial Park and currently employs nearly 400 people, with all kinds of advanced manufacturing and processing equipment nearly 300 sets , the first global manufacturer of steel plank , for an annual capacity of 60,000 tons, and with an annual capacity of scaffolding 150,000 tons. 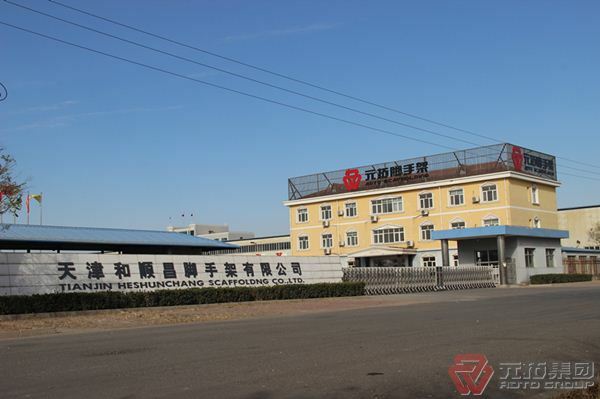 Tianjin Heshunchang Scaffolding Co., Ltd. mainly deal with: ringlock system scaffodling, frame system scaffodling cuplock system scaffolding ,Kwikstage system scaffolding and coupler&pipe scaffolding,etc. The company use a comprehensive quality management since its established ,on the basis of study products manufacture technology and advanced management method from abroad , through its own research and innovation, the company formation of a scientific and efficient new scaffolding manufacturing process management system. All of the production of new scaffolding use high quality steel material , and use electronically controlled automatic digital welding equipment , products surface finished with hot dipped galvanized to anti-rust and anti-corrosion , in strict accordance with ISO quality management system standards . The company has more than 40 national patents , especially jack base products, a world leader with JIS standard approved . The new type scaffoldings producted by Tianjin heshunchang scaffolding co., LTD applicated to global construction area, they have a good reputation in domestic and abroad of construction companies, renting companies, real estate companies.The scaffolding company will enlarge and increase investment in reseach and development furtherly, to enhance sales,and establish China's new scaffolding manufacturing aircraft carrier, to promote global scaffolding manufacturing industry healthy and sustainable development.